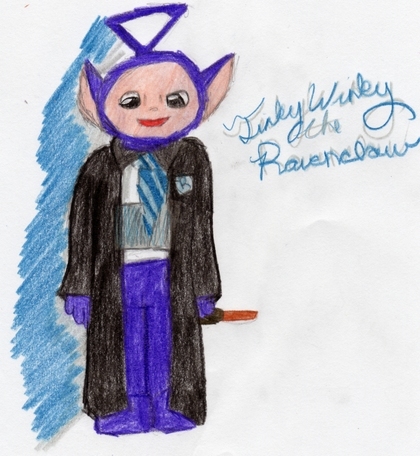 Home » wild_spirit » Pictures » Tinky Winky the Ravenclaw!!!!! I laughed too hard...i think I died...i clicked on it, not remembering who tinky winky was, and I saw it and i'm like...oh, no...hahahaha!! THATS AN INSULT TO RAVENCLAW!!! jk its funny!! MY PAST HAS COME BACK TO HAUNT ME! some random person: what the hell are you talking about? me: well when i was little i was picked on 'cos i liked tellytubbies and i belive in faeries. Moon: your my other half that is laughing! Moon: now i do! ^_^ Im gonna look out for the other houses! WEEEEEE! LMAO!! I lovvvvvvvvveeeeeeeee it!!! lmfao!!!!!!!! its awsome it really good hehe....i like lala....SHES YELLOW!!!! Rock On Nicky and Cheer Up!! !